The value of pipe #286 is n/a points. Thornton Ege offered a treasure trove of five the pipe specimens on eBay. When the dust settled, the blue bent was marginally better than the previous specimen (which was moved to the Pipes for Sale page) and will stay in the collection until I get a better example. The maroon author, orange bent and white Canadian are color/shape combinations I have longed for and proudly take their place in the collection. 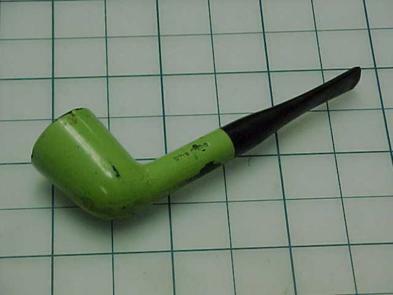 The green Dublin, a very rough specimen indeed which I suppose is why he threw it in as sixth "bonus pipe," and the pink author were duplicates of pipes already in the collection. They were placed on the Pipes for Sale page. Richard Kaminski snapped this one up when he bought #217.